Or as low as $183.33 per month over 6 months. Apply Now. 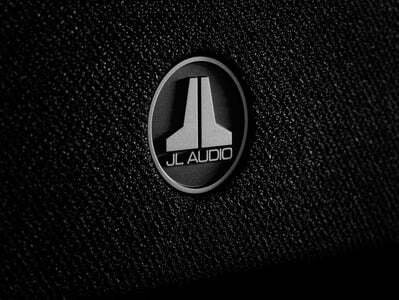 Born from JL Audio Dominion d108 vast collection of advanced technologies, Dominion powered subwoofers combine a state-of-the-art subwoofer driver and an advanced Class D amplifier to deliver unmatched performance and value for a wide variety of compact applications. Purpose-built to reproduce powerful low-frequency events with stunning impact and precision, the Dominion driver employs JL Audio’s exclusive DMA (Dynamic Motor Analysis) technology to produce higher output levels with reduced distortion, as well as improved dynamic tracking and resolution. 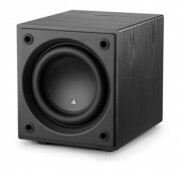 As a result, Dominion subwoofers are capable of peak-to-peak excursions well in excess of 2.5-inches (63 mm – d108), and 2.7 inches (68 mm – d110), without distress or audible distortion. 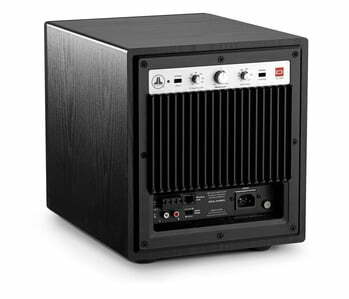 Dominion amplifiers utilize an advanced Class D design in order to extract the most from the long-excursion driver platform. This design features a tightly regulated switching power supply, allowing the amplifier to generate prodigious amounts of unclipped output voltages. These technologies ensure that the Dominion powered subwoofers remain in their comfort zone, which is well beyond the point where most small subwoofers run out of power or driver capability. With a host of signal processing features included, Dominion powered subwoofers can be integrated into most systems with ease. Low-pass signals are precisely guided, thanks to the onboard crossover’s 24 dB/octave Linkwitz-Riley alignment. 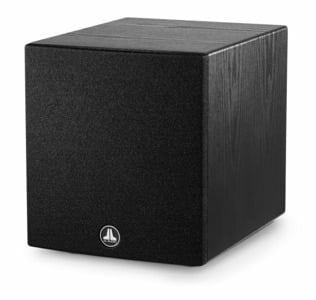 Phase and polarity controls are onboard to aid in achieving the optimal acoustic transition between the subwoofer(s) and main speakers. Flexible input options are on-hand to accept either line-level or speaker-level signals. Connect a JLINK TRX system (sold separately) to the onboard Wireless Link port and enjoy the freedom to position your Dominion almost anywhere, up to 100 feet (30 meters) away from your source unit. To contain the immense pressures created by the Dominion driver, each beautiful cabinet is carefully engineered and constructed using solid, CNC-cut, MDF material with extensive internal bracing and advanced assembly techniques. All Dominion powered subwoofers are built with pride and precision in JL Audio’s U.S. factory to deliver years of listening enjoyment.